The Gull Lake Boat Launch Inspection Station will open on the May long weekend of 2018 and operate until Labour Day weekend. The hours of operation will be daily from 7:00 am to 9:00 pm. A locked gate will block access outside of regularly scheduled and posted hours. A phone number will be provided for potential boat launch users to access inspection services outside of the posted hours. 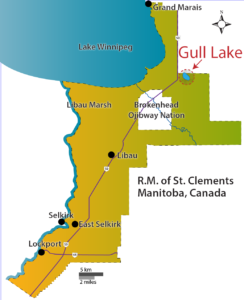 Gull Lake is the centre of a small cottage/residential community located in the Rural Municipality of St. Clements. 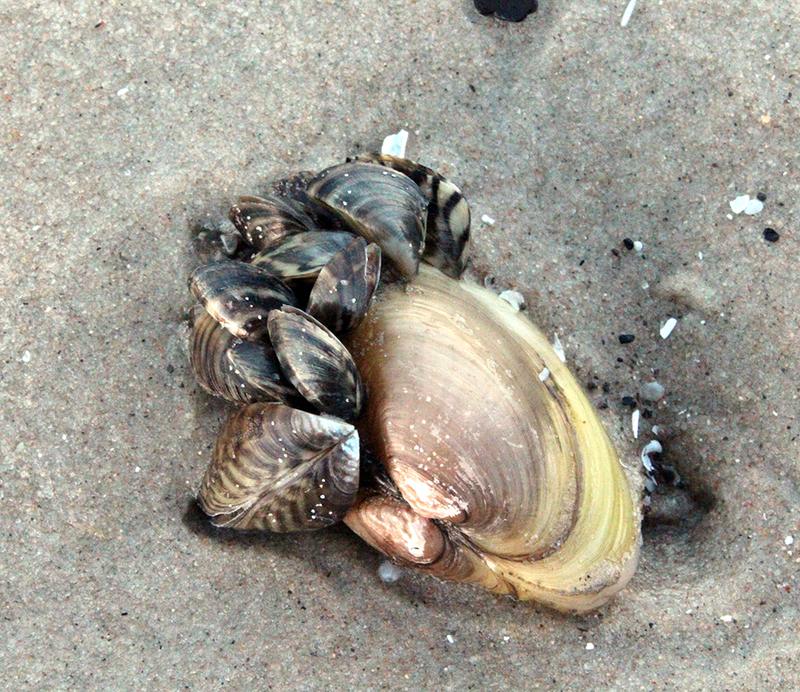 Residents have been increasingly concerned about the recent spread of zebra mussels, an aquatic invasive species, to Manitoba (learn more about zebra mussels here). As far as we know, zebra mussels are not yet in Gull Lake. Concerned Gull Lake volunteers have worked for several years now to prevent zebra mussels from entering Gull Lake, but with limited finances and resources. In the fall of 2017, they approached the RM of St. Clements for assistance and the outcome is that the RM has proposed to create a Special Service charge to fund an access controlled boat launch and inspection station. The committee explored many options and felt this simple approach, while not perfect, could meet the urgent need to protect Gull Lake. A public hearing was held on November 7, 2017 for residents to voice their concerns. Council modified the plan based on public input and approved it. What changed from the original plan? The annual charge per parcel of land would be $100. The charge per parcel should be less than this and the RM should contribute some money toward this project. Residents of occupied properties would pay 100% of the costs. Any surplus funds collected through the special service charge would be given to the Gull Lake Basin Management Board for equipment maintenance. If there are surplus funds from the special charge, the money should be returned to the taxpayer. 298 occupied properties were going to pay the service charge. 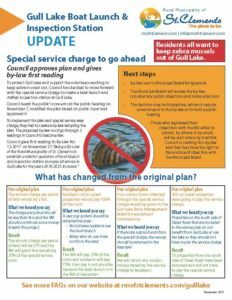 Properties on the south side of Stead Road that are included in the service plan do not benefit from Gull Lake or use the lake so they should not have to pay the service charge. 15 properties from the south side of Stead Road have been removed and will not have to pay the special service charge. To implement this plan and special services area charge, Council created a by-law adopting the plan. The proposed by-law must now go through three readings in Council to become law. When will you start charging us? You will be charged on your 2018 property tax bill. Can the by-law be changed after the public hearing and if so, do residents have to be noticed? Yes, the by-law can be changed. If the amendments negatively impact the ratepayers, another public hearing might have to be held. Can Council cancel this by-law before its review date in 2023? Yes, if a petition representing fifty properties is received. If a vacant lot becomes occupied, can it be added to the special service area? What is a special service charge? When residents of a particular neighbourhood request services beyond what is normal in the municipality, the RM must create something called a special service charge to ensure only people in that neighbourhood pay for it. This process is outlined in the Manitoba Municipal Act. The cost for a service is calculated for a particular area and then spread amongst properties identified within the special service area. How does a special service charge work? Have any other funding options for this been explored? Yes, Gull Lake Basin Management Board has explored other funding options and there are none at this time. Why don’t we charge a user fee to use the boat launch to target non-residents? The RM of St. Clements cannot charge user fees for the boat launch because it is located in the RM of Alexander. On its own, the Gull Lake Basin Management Board does not have the authority to charge boat launch fees either. In light of this the RM will contribute 25% of the cost of the service. Does the RM of Alexander support this initiative? Yes, the RM of Alexander is aware of this initiative and supports it. If they withdraw their support, the service would end and residents would stop paying the special service charge. I do not have a boat, can I choose not to be part of the special service charge? No. All properties included within the special service area must pay as per legislation. The proposed plan does not include vacant properties. These properties do not have to pay the $100 annual fee. How is the presence of zebra mussels monitored? The province relies on reports from the public via their website or by calling 1-87-STOP AIS-0 (1-877-867-2470). Residents should watch for them by periodically checking items that are immersed in the lake. 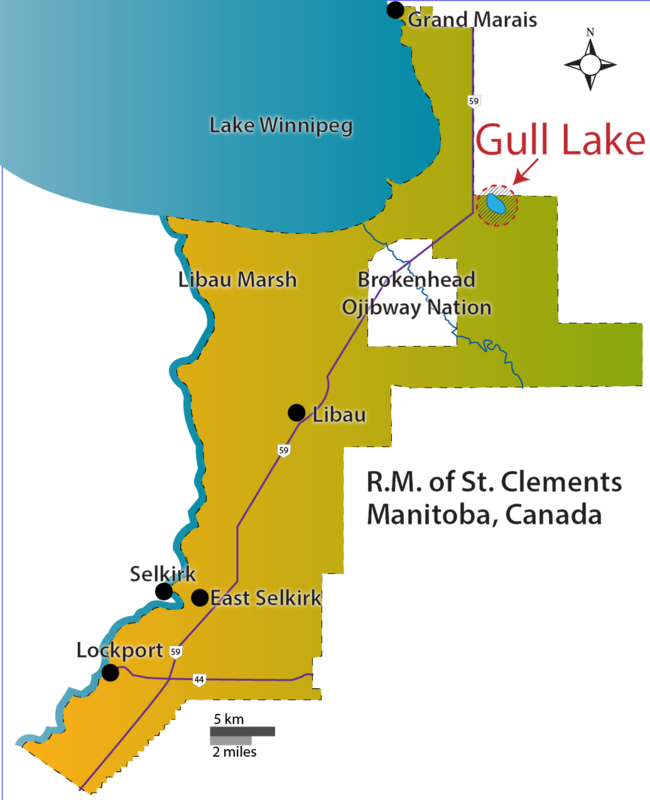 The RM of St. Clements will provide the service, however the day to day management will be by volunteer members of the Gull Lake Basin Management Board. Has the RM of Alexander agreed to the terms of this arrangement? As stated the boat launch is their property? 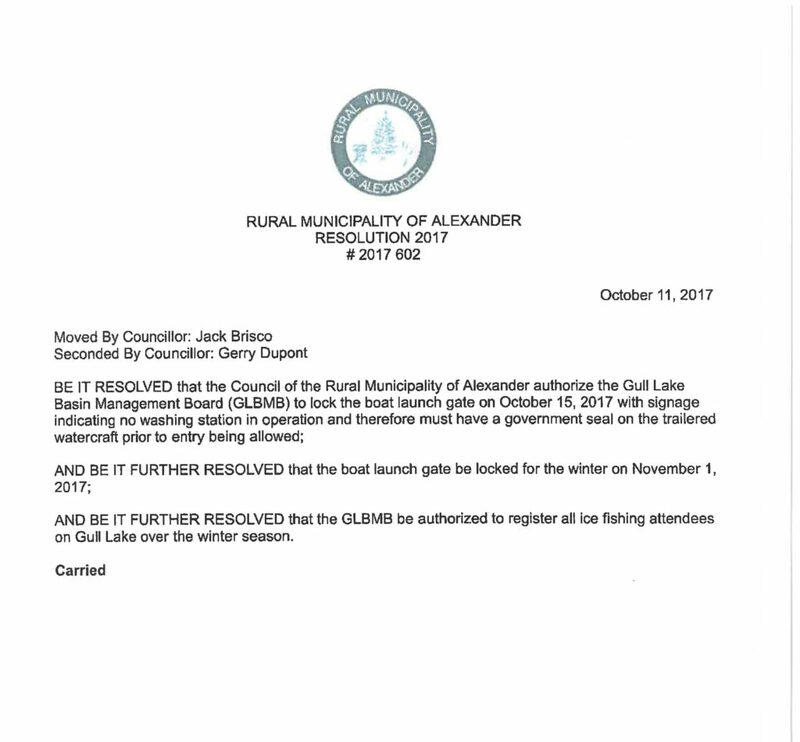 It the RM of Alexander decided to stop allowing their property to be locked will the fee be removed? Hi. The RM of Alexander is aware of this plan and is fully on-board with it. In order for this intent to control the zebra mussels to be fully effective, the many private docks at cottages around Gull Lake should be limited to the private owner’s of those properties. Too often when the public launch, which has the proper equipment is closed, boat owners will launch their boats at these properties without the proper cleaning. Is the RM looking at any by-laws that could prevent this? Will the property owners be notified if there is another hearing? Thanks for sharing your concerns. The RM is not considering any bylaws as the province already has a law that prevents transporting zebra mussels. Boat owners must take responsibility for properly cleaning their boats and water equipment if they don’t want to introduce zebra mussels into Gull Lake. The RM will not be holding any more hearings. Last Tuesday, November 21, Council approved the Gull Lake boat launch inspection station plan and adopted it into a bylaw to which they gave first reading. They have to give the bylaw two more readings for it to be in effect. It has been sent to the Municipal Board for review. The Municipal Board might decide to approve it, reject it, amend it and/or call a public hearing. Those who have voiced their objections with the RM will be notified that they have a right to register their objection with the Municipal Board. Notice will be given if there is a hearing. Just wondering, has there been any outcome to this meeting? Hi Helen, Yes, council decided last Tuesday to go ahead with the plan. We will be sending out details later today. Does that include another mailing to the area or is the new info just shown on this webpage? No, it is not another mailing, just the information on this web page. I own property in the Municipality (not in Gull Lake) and object to subsidizing 25% of the cost of the program for the benefit of residents there from my tax dollars. I am guessing that the vacant lots are owned by someone and those owners shouldn’t get a free ride and have their investments subsidized by other property owners in Gull Lake and others in the rest of the municipality. Hi Grant, some users of the Gull Lake boat launch are not residents of Gull Lake. Because the boat launch is located in the RM of Alexander, the RM of St. Clements cannot charge a user fee. The RM’s contribution of 25% or $7,075 is to help cover the cost of non-residents using the boat launch. It is very important to local residents and the RM to keep zebra mussels out of Gull Lake.